I woke up at 3:15. I must have known it was coming up soon in my subconscious as I had my phone in my hand, ready. I got up and had a shower, packed my last couple of things and went down stairs to wait for the taxi. The journey to the airport would have been 10 minutes but it cost me 37Euro! The guy in the hostel said it would be that much but I didn’t have any other choice. There were no buses or anything so I just did it but I just can’t believe how short the trip was. Anyway, I arrived at the airport and did the usual baggage dump and security check. Eventually we were allowed to board and blah blah blah. It’s a flight. It’s all the same. I’m falling asleep writing about it let alone reading it. It was a two legged journey with the stop over in Amsterdam. I only had an hour in between so it was perfect. Again, same business as before. Board, take off, land, unboard. Although this time I had to collect luggage as well! Curve ball incoming. This is the part when things always get interesting. I had to get from the airport to my hostel. I had studied this pretty hard. I knew that there was a fast train to the main station but I asked at a help counter what my options were and she said there was a slow train as well for about half the price. I went and bought my ticket which was far easier than it usually is and as soon as I got down onto the platform (correct one first go), the train pulled up. It was a nice trip in. I had my music in and I was just watching NORWAY go past. When I first left the airport, visibility was down to 200-300m because of fog. Now this seems not great as it is, especially because someone just landed me with that poor visibility, but the thing is, it was about 12:30. Don’t be stupid Norway, fog disappears no later than 9:00. It can’t hang around all frikin day. When I made it to the main station, I had memorized a route using Google maps and Google earth to see what it was going to look like. This was perfect. I came out of the station and knew exactly where I was and where I needed to be. I walked to the hostel without a problem (because I felt like I had already been there) and checked in. I went up to my room, which had a door guarding the hallway which was difficult to open and then a lock on the door to the room itself which was as equally hard to open. I do feel safe though. I made my bed and put all my stuff down before going off to walk around what looked like old town. I had seen it on the way when I was walking from the train station. It wasn’t so much of an old town but just a shopping area. Kind of like the centre of Perth with the occasional older building as well. There is a cathedral and just lots of shops. 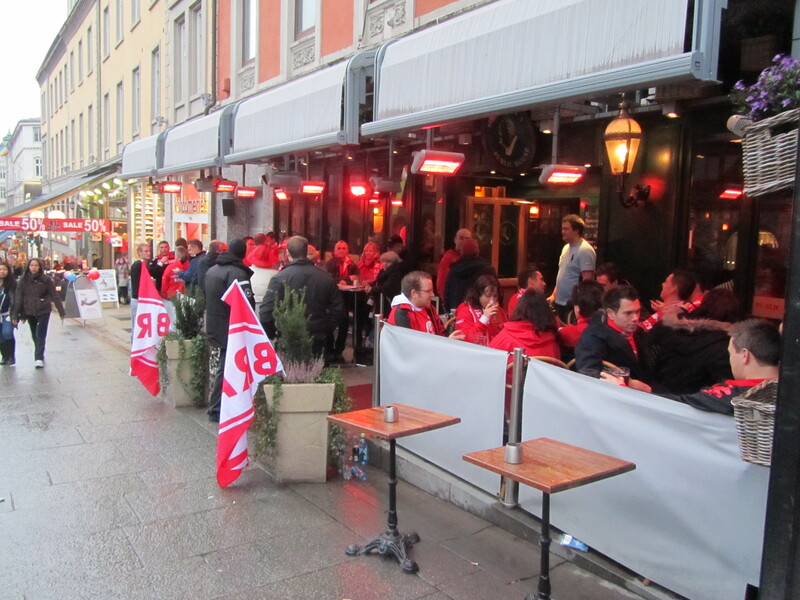 What was interesting though was the amount of people wearing red and white scarfs. I had struggled to find accommodation for just the Saturday night and I think it was because of a soccer or ice hockey game. There were swarms of people wearing their scarfs and sometimes people wearing an orange on instead. It was a great atmosphere. All the pub were full and some overflowing with people and singing on the street. As it started to get dark, I decided to start going back to the hostel. On the way, I was looking for a book store that sold Lonely Planet guides and I found a place that had what I was looking for. My staple, Europe on a Shoestring. And I got in just at the right time. This edition was published in October. I then went to a supermarket that I had passed for some dinner and breakfast. inspired by the dinner the night before, I chose omelette with sausage and onion. It’s versatile because I can have it for breakfast as well. 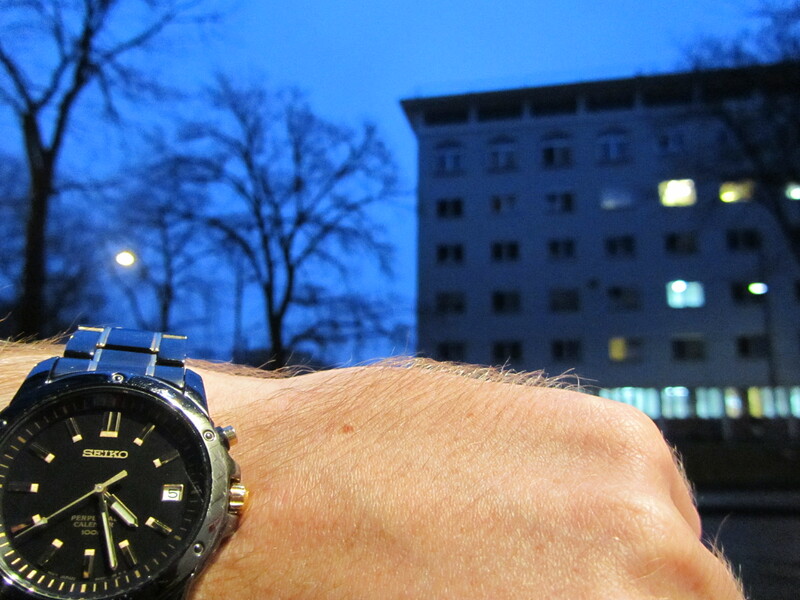 I then went back to the hostel and looked at the watch to decided if it was actually late enough. It wasn’t really. It was still 4:00… Basically the way it works around here is that the sun will start going down really early but take a while to actually go down. Twilight is really long is what I am trying to say. As it really was too early, I just went up to the room with the idea of writing or whatever. I ended up talking to some Brazilians that are currently living in Denmark. I talked to them for about 3 hours I think. I didn’t even notice the time disappear. Just got along with them super well. At about 8:00, agreed it was just about time for dinner. They went off and I just cooked my food. It was pretty average. The sausages were more like polony which I don’t mind eating, It’s just not what I wanted. When I finished eating, I sat down to write again. Not long after I started, 4 guys in the room came back from wherever they were drinking. They were supporters of the red team. Turns out the red team is Bergen (Brann is the team name) which is a city on the west coast and the other team was Aalesund and it was the ‘cup’ final. It’s not the most prestigious tournament but it is the biggest single game of the year for Norwegians. I talk to these guys for a while and one asked when I was leaving Oslo and where I was going next. I told him that I was staying for 3 more night and he said it was a pity cos he offered to give me a lift to Bergen if I wanted. When they left, I went to reception and cancelled my next two night and gave that guy a call and told him I was coming.